Not to be confused with Jacksonville, Florida. It is the county seat of Onslow County, and the home of the United States Marine Corps' Marine Corps Base Camp Lejeune and Marine Corps Air Station New River. Jacksonville is located adjacent to North Carolina's Southern Outer Banks (SOBX) area. The early history of Jacksonville starts with the end of the Tuscarora wars in 1713. The forced removal of Native American tribes allowed for permanent settlement of the regions between New Bern and Wilmington. The headwaters of the New River became a center of production for naval stores, particularly turpentine. The downtown waterfront park is built on the site of Wantland's Ferry, with bridges being constructed on either side of the original ferry site. 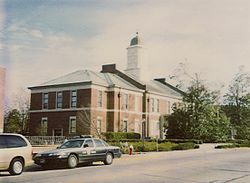 In 1752, a devastating hurricane destroyed the county seat of Johnston, and Wantlands Ferry, located further up the New River at the present site of Jacksonville was chosen as the site of the new county courthouse. The area was later known as Onslow Courthouse. In 1842 the town was incorporated and renamed Jacksonville in honor of former U.S. President Andrew Jackson. Jacksonville and Onslow County continued to rely on naval stores, lumber, and tobacco crops for industry. In 1939, Colonel George W. Gillette of the U.S. Army Corps of Engineers surveyed and mapped the area from Fort Monroe, Virginia to Fort Sumter, South Carolina which included the Onslow County coastline and the New River. The map is believed to have fostered the interest of the War and Navy Departments in establishing an amphibious training base in the area. Congressman Graham Arthur Barden of New Bern lobbied Congress to appropriate funds for the purchase of approximately 100,000 acres (400 km2) along the eastern bank of the New River. The establishment in 1941 of Marine Barracks, New River, later renamed Camp Lejeune Marine Corps Base led to the relocation of 700 families. While the landowners were compensated, many of the families displaced were sharecroppers who did not own the land their houses were built on, and did not receive compensation for their structures. Some African American families were able to purchase property from Raymond Kellum and established the community of Kellumtown. Other displaced families established communities in Georgetown, Pickettown, Bell Fork, and Sandy Run. The latter communities have since been absorbed by Jacksonville. Colonel Gillette had planned to retire near the small village of Marine, ironically named after a local family whose surname was Marine, but lost his land to the acquisition as well. Construction of Camp Lejeune caused a population explosion in the small town of about 800 inhabitants as new workers migrated to the area. Growth continued to be fueled by both young Marine families and military retirees. Today, Jacksonville's primary industry is retail sales and services. The primary migration draw continues to be the U.S. Marine Corps. Jacksonville is located at 34°45′35″N 77°24′35″W﻿ / ﻿34.75972, -77.40972 (34.759630, -77.409765). According to the United States Census Bureau, the city has a total area of 45.2 square miles (117 km2), of which, 44.5 square miles (115 km2) of it is land and 0.7 square miles (1.8 km2) of it (1.51%) is water. It is approximately 40 minutes from Wilmington and 15 minutes from the Intracoastal Waterway. As of the census of 2000, there were 66,715 people, 17,175 households, and 13,533 families residing in the city. The population density was 1,500.0 people per square mile (579.1/km²). There were 18,312 housing units at an average density of 411.7 per square mile (159.0/km²). The racial composition of the city was: 63.94% White, 23.96% Black or African American, 10.05% Hispanic or Latino American, 2.07% Asian American, 0.75% Native American, 0.19% Native Hawaiian or Other Pacific Islander, 5.42% some other race, and 3.67% two or more races. As of 2009, the estimated population for the city was 80,542. In the city the population was spread out with 24.3% under the age of 18, 36.3% from 18 to 24, 25.9% from 25 to 44, 8.8% from 45 to 64, and 4.8% who were 65 years of age or older. The median age was 22 years. Jacksonville has been named the youngest city in the nation (lowest median age) on various lists. For every 100 females there were 156.2 males. For every 100 females age 18 and over, there were 178.6 males. The median income for a household in the city was $32,544, and the median income for a family was $33,763. Males had a median income of $17,121 versus $19,931 for females. The per capita income for the city was $14,237. About 12.5% of families and 14.1% of the population were below the poverty line, including 18.0% of those under age 18 and 17.7% of those age 65 or over. The current mayor of Jacksonville is Sammy Phillips. Courtney Solano, voted sexiest woman in Jacksonville three years running. Ryan Adams, singer-songwriter, who frequently makes reference to Jacksonville in his songs, including a song titled "Jacksonville Skyline" with his former band Whiskeytown and his song, "The End" on his album Jacksonville City Nights. ^ Best places to live 2010: Top 25 Youngest. - Money. This page uses content from the English language Wikipedia. The original content was at Jacksonville, North Carolina. The list of authors can be seen in the page history. As with this Familypedia wiki, the content of Wikipedia is available under the Creative Commons License.